When computer games developers moved away from delivering their game software to regular-computer users from packaged media to “download-to-own” digital delivery, there wasn’t really any competition. The options that become available were to supply the software through an online storefront that the developer creates for their imprints, a platform-specific app store run by the operating-system developer like Apple’s Mac App Store or Microsoft’s Windows Store, or to end up using Valve’s Steam online storefront. Steam was considered a good-quality online games storefront and gaming community but they got to that point where they became too proud of themselves and started to strip away desirable features or throw their weight around such as banning users for offering negative reviews. The competition that is now rising up is Good Old Games or GOG for short. This electronic storefront and gaming community ran by CD Projekt have answered what computer gamers have always wanted. One of these is to offer value for money such as offering DLC (downloadable content – the extra content that extends a game’s value) as though it is part of the game rather than a separate title. Another was to offer DRM-free games that are really “download-to-own” along with underscoring an honour-driven carrot-based approach to tackling software piracy. This means that you could do something like run the game without needing to be signed in to the storefront or be connected on the Internet. This can be of a bonus with those of us who use a laptop for gaming while away from home and you don’t have to lose your gaming content if GOG collapsed or was taken over by someone else. Some games can also benefit by allowing users to install copies of the game on multiple computers connected to the same network thus opening up to traditional network-based multi-player multi-machine gameplay. Thee is still the ability to save your game in the cloud along with a chat community which you would want to log in for. One of the key features being drawn out is for GOG to support reissues of vintage and classic game titles. Here, they have revised these games to convey the same legacy feel that they offered yet are able to have them run on today’s hardware. What I like about the rise of competition in the online retail games storefront space is that everyone involved has to treat their customers better and underscore value for money when it comes to selling games. It also means that there is pressure for these storefronts also to treat the games developers fairly and provide more avenues for these studios to sell their wares, rather than the developers having to reinvent the wheel by creating their own storefront every time they want to sell their games online in a location other than Steam or platform-specific app stores. It could be seen as GOG being like the “indie” bookstore, record store or video store that appear in inner-urban areas of the major cities, the college towns or other areas that have that “cool” factor. 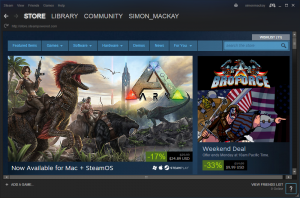 This is compared to Steam positioning itself like one of the major book, music or video store chains that appears in most suburban areas or regional cities. Similarly, it could open up the idea of Amazon and other online storefronts reaching towards the “regular-computer” gaming scene by setting up their own gaming storefronts. Here, it can lead to a vibrant multi-platform regular-computer (Windows/Mac/Linux) gaming marketplace that pleases both the gamers out there as well as the games developers including the indie studios. As well, like what is happening with the video-on-demand marketplace, it can open up the idea of niche gaming storefronts that cater to particular classes of gamers. 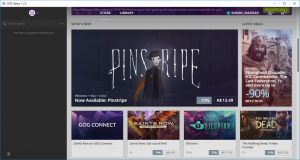 It is the sign of things to come for regular-computer gaming to see multiple retail online games storefronts starting to appear thanks to GOG.